Why put an expensive camera in any ol’ bag when there are so many cute and stylish choice to choose from? Anyone who wants to use something more than an iPhone for their photos will need a camera bag for lenses, disks, DSLR camera, and more. Simply stuffing a camera inside a handbag in bubble wrap is not the best alternative! Of course, there is no question that all the essentials must be present. Padded pockets, roomy, sturdiness, loads of compartments, and waterproof properties are a must. 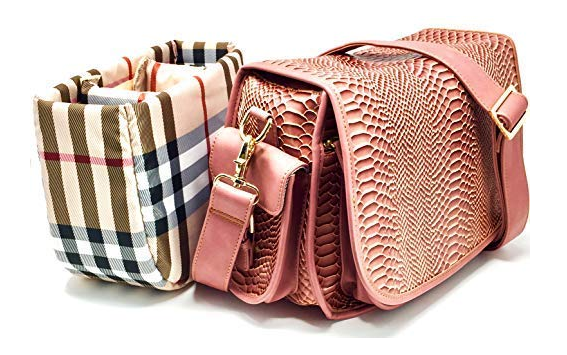 Fashionable camera bags should be a step or two above the usual humdrum designs are usually found on offer in many brick and mortar and online stores. Camera bags for ladies come in so many cute, fun, and attractive styles these days that it can be tough to choose just one! Here is a list of some top rated camera bags designed for women, along with pros and cons of purchasing each. From Purple Relic comes this highly stylish bag with removable camera case offered several attractive designs. It’s made with vegan leather, which is a quality leather substitute. Before purchasing, be sure to check the list to learn which cameras this attractive bag suits. PROS: This is quite versatile because it can be used as a camera bag as well as a cross body, office, or everyday hand bag. The adjustable compartments are removable for convenience and cushioned for security of valuables. 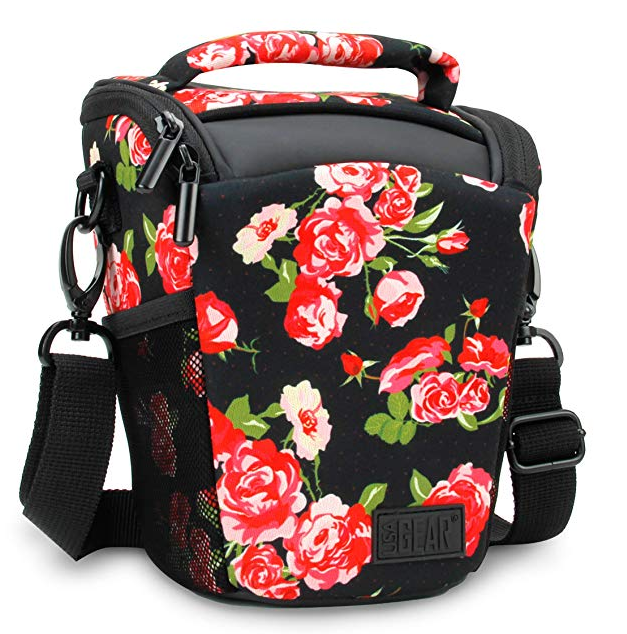 It has a beautifully designed, printed cotton lining that matches the removable camera case. It holds enough equipment for an everyday camera shoot, particularly for amateurs who don’t have a ton of gear. CONS: The size can be a bit restrictive for those whose photography needs are greater. Plus, a few reviewers state the bag does not hold as much equipment as they would have liked. 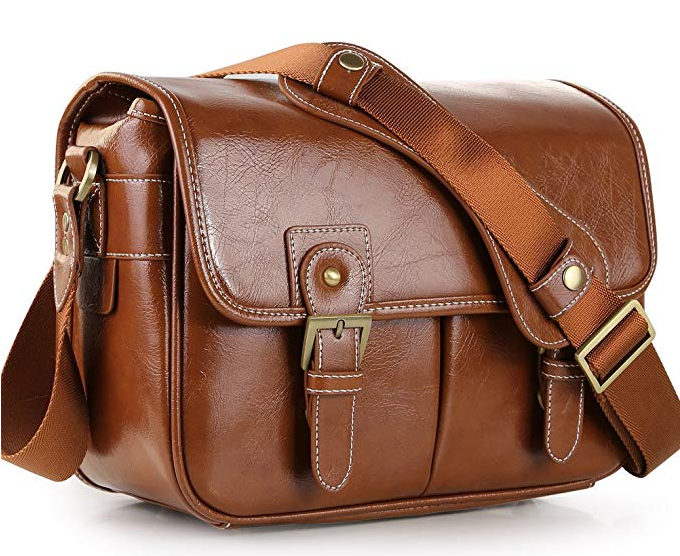 This bag may be more suitable for amateur photographers or just to be used as a regular hand bag. From USA Gear is this weather resistant camera bag made of durable neoprene. USA Gear is dedicated to providing all manner of gear related to carrying various equipment such as cameras and camera accessories. PROS: The bag loads from the top for convenience and easy accessibility of equipment. The rugged bottom provides a secure measure for setting the bag down without attracting dirt or moisture. The padded lining allows cameras to be placed inside without worrying that they’re being tossed about. The ergonomic design with adjustable shoulder strap provides solid comfort for multiple carrying options. The scratch resistant fabric used on the internal lining helps to protect cameras and all accessories to keep them in optimum working order. The bag comes in quite a few different colors and designs, ranging from floral to camouflage. Additionally, the accompanying rain pouch for extra convenience. CONS: The main compartment can be a bit small for certain cameras and gear. Anyone considering purchasing this bag specifically to carry their camera equipment should be sure to check with the manufacturer regarding which cameras and gear fit inside. Kattee Fashion is a well-known provider of fun and stylish camera bags, and this bag is no exception. It’s made of imitation leather and high-density canvas for security and weather resistance. PROS: Three easy compartments inside make for convenience and accessibility to camera equipment. It also contains additional outer pockets that can hold phone, wallet, business cards, and more. The lining can be removed for easy cleaning. The self-adhering padded dividers are soft and protective of electronic gear to prevent damage. Additionally, the size of this one is a little larger to fit more gear and larger-sized camera and lenses. CONS: Some reviewers comment that the colors shown are not true to the actual colors. Additionally, issues with hardware such as front snaps and buckles have been noted. BAGSMART is known for its versatile bags that provide organizational convenience. They offer this lovely water resistant camera bag that contains a number of compartments, both inside and out, for optimum accessibility. PROS: The main compartment is made of water resistant, padded fabric that provides the protection camera equipment requires. Convertible pocket that has Velcro attaches to a suitcase. The flap buckle closure with zipper and Velcro protect gear inside from theft or falling out. This bag also contains many dividers, compartments, and pockets for easy carrying of quite a bit of camera equipment and accessories. Additionally, the bag is large enough to hold a solid amount of equipment, but with the many dividers and compartments, each piece can be well protected from the next. CONS: A few reviewers comment that the bag is not as big as they anticipated, so those considering purchasing it should get the dimensions beforehand. Koolertron is one of the leading brands of consumer electronics around. 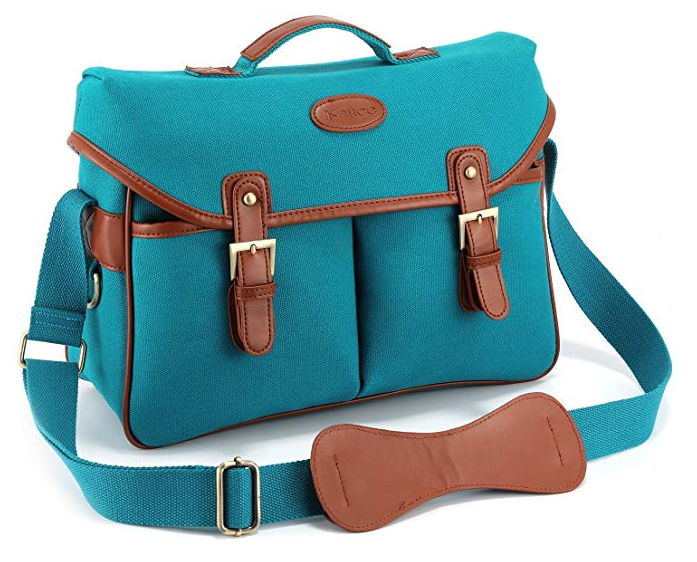 They offer this classically styled camera bag that’s both waterproof and fashionable. Made from PU leather (synthetic leather made from polyurethane), the bag fits a DSLR (digital single lens reflex) with two lenses. PROS: The bag’s removable liner is removable, so can be used as a leisure bag. It also has three convenient dividers that make it capable of holding large pieces of camera gear. The bag comes in two attractive styles that are capable of complementing any outfit. 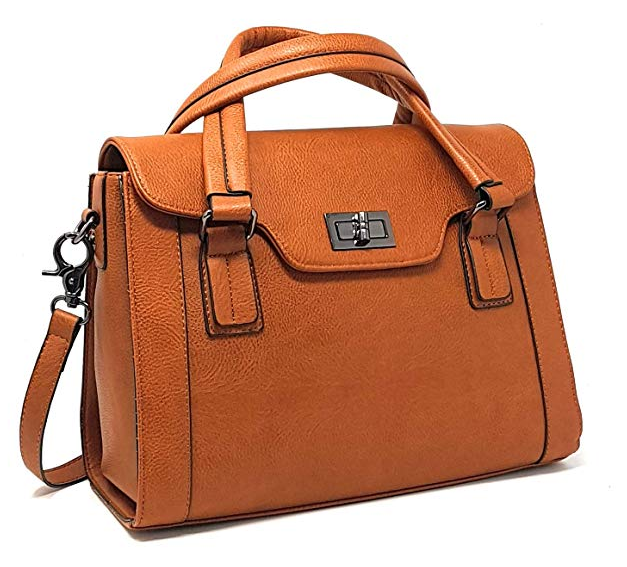 The leather look is pretty, and the front pockets help to round out the versatility and organizational convenience of this bag. CONS: The bag may be smaller than needed, as it holds only one DSLR and two lenses. As always, be sure to check the dimensions as well as the brands/equipment that can suitably fit inside this bag. 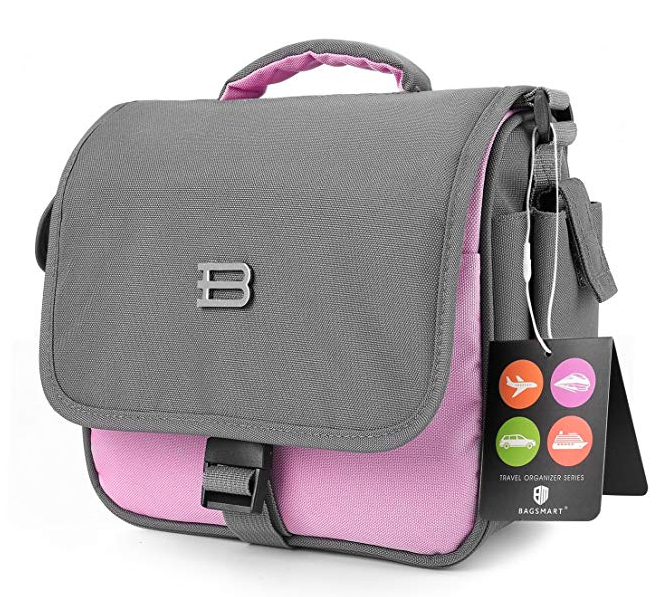 Here is another very cute and stylish camera bag for women from Purple Relic. It’s a camera bag that doubles as an attractive cross body hand bag. Made from faux leather, it fits standard sized camera and lens and contains removable padded inserts. PROS: The removable insert has three adjustable compartments for great management of space and exceptional organizational capability. It contains a beautiful printed checkered lining that makes for a lovely handbag. There are a number of compartments and pockets that make carrying accessories easy and accessible for handy use. The removable insert can be taken out and cleaned separately. Plus, it comes in several attractive styles that range from classic to trendy. CONS: Strap has been noted to cause discomfort. Additionally, some remark the bag does not hold enough gear. Be sure to learn which cameras and equipment the bag can hold before purchasing. “Taking pictures is like tiptoeing into the kitchen late at night and stealing Oreo cookies.” American photographer Diane Arbus made this eloquent and quite charming remark of photography, and those who do it, understand the insight expressed here. A photograph is a precious reminder of a moment passed. It has the power to transport a person to not just a place in the past, but also an emotion long gone. This is why the equipment used in this noble pursuit is so important and must be kept in fine working order. Simply carrying a camera on a neck strap or tossing into a purse with all manner of other items is a bad decision. Like other equipment, camera gear demands proper care, which is why a camera bag is essential. But a camera bag does not have to be simply practical. It can be a fun, attractive addition to an ensemble, and it can make a statement about its user. There are a number of reasons to purchase a camera bag as opposed to using just any old bag to carry it. First and perhaps most important to everyone is cost. Camera equipment is expensive, and so it needs to be properly cared for in order to work optimally every time it’s used. Convenience is another important reason to buy a bag dedicated specifically to camera gear. The manufacturers of camera bags are well versed in photography, which means they understand the needs of photographers, be they amateur or professional. For this reason, they design bags that give photographers better accessibility to their gear and improved comfort over other bags. Another argument in the case for camera bags is optimized organization of equipment. And, finally, with today’s myriad designs, there’s an attractive and expressive style to suit every taste. Shoulder straps and belts, dedicated cleaning cloths, proper lenses, cushioned separators – these are all items that help both amateurs and pros properly care for their expensive camera gear. Simply tossing a camera and all its associated equipment into a backpack or purse that was not specifically designed for photographic gear causes the life of each of these important pieces of equipment to drain more quickly than intended. Taking good care of equipment extends its life, and that adds up to significant savings. Because camera gear needs to be cared for in a certain way, placing each piece in its own convenient, separate location is important. It helps not just to keep it safe, but also gives users easy accessibility to all their gear when they need it. Camera bags come equipped with cubby holes and compartments that make grabbing for equipment quick and easy. Proper organization is a vital part of accessibility. A camera bag that’s made specifically for photographic equipment is designed by people who understand everything from aspect ratio to focal length to subtractive lighting. This means they understand how photographers need to organize their equipment on every shoot. No other bag can offer the organization techniques necessary to store and access gear when it’s needed. The boring camera bags of yesterday are gone. Today’s market offers nearly limitless colors and designs that can not only enhance the shooting experience, but can also complement just about anyone’s personal style. The features needed in a camera bag start and end with the particular needs of every photographer. Obviously, enthusiastic amateurs have different needs than professionals. This also typically means their equipment costs vary. The equipment of someone who enjoys taking weekend pictures of family events generally would not cost as much as a veteran photographer whose livelihood depends on the quality of his or her pictures and, thus, the quality of their gear. When purchasing a camera bag, it’s important for each photographer to take into consideration the level of photography they perform, as well as the cost of their equipment. The type of shoot also is important when choosing a bag. Some photographers find they need more than one camera bag due to the varied types of shoots they go on. For instance, mirror-less camera bags are common for everyday use. These can be ideal for amateurs and pros alike as the go-to bag because of their compact convenience. Tripod and drone bags are typically used by professionals whose equipment needs larger spaces and greater security. Naturally, budget also can be a significant factor. The cost of camera bags can run the gamut, from around $30 or $40 all the way up to thousands. The good news is that a solid, quality camera bag doesn’t have to break the bank. Camera bags come in varied sizes and types. The size needed typically depends on the size and number of pieces of camera gear used. Additionally, some bags are proper to use on a shoot, while others such as roller bags are used solely for storing or transporting camera equipment. Whether a photographer chooses a backpack that’s comfortable to carry or a shoulder bag with easy access often hinges on personal comfort and organizational style. Here are some additional items to consider when purchasing a camera bag. Naturally, not every camera bag holds every camera. Some smaller bags may only hold one DSLR and a lens or two. Additionally, just because a bag holds a DSLR does not mean it holds every brand. Be sure to check the product details or speak with the manufacturer if necessary in order to learn which bags hold which camera gear. As with any purchase, it is incumbent upon purchasers to be particularly mindful of details provided by the manufacturer. Because not all camera bags can accommodate all camera gear, be sure to learn product dimensions, compartments, and specific brands and camera equipment each bag holds. Additionally, one of the best ways to learn about a product is to read reviews from those who have purchased and used it.